Birders Guide to Pelee & Essex Co.
Tuesday, March 31: Purple Finches suddenly appeared at many local sites over the past couple of days. A male was singing by the nature centre feeders yesterday. It is usually possible to pick out several Pine Siskins among all the moulting goldfinches that are visiting the niger feeders. Thursday, March 26: Dan Loncke reported 3 Gadwall, 4 Bufflehead and 7 Ring-necked Ducks in the large storm water retention pond by Little River today. He also saw Eastern Phoebe (3), Winter Wren, and several Golden-crowned Kinglets. Here at Ojibway Dave and Carey Lana saw 4 Northern Flickers, Brown Creeper, Eastern Phoebe, kinglets and a Belted Kingfisher yesterday. We have also noted an increase in the number of Song Sparrows lately at the feeders and our first Eastern Towhee yesterday. The first Fox Sparrow was reported by Brad Hamel at Tallgrass Prairie Heritage Park on March 21. Thursday, March 19: Fifty-three people attended our Owl Prowl this evening. After a talk in the nature centre everyone had great looks at a Screech-Owl that was poking its head out of a nearby nest box. We then went for a walk through the woods and, after stopping to look at a White-tailed Deer, Tom Preney found another owl that perched in the open by the trail, flew over everyone's heads and even sang for the group. Our next deer hike and Owl Prowl will be on Thursday, April 16 (register early as space is limited). 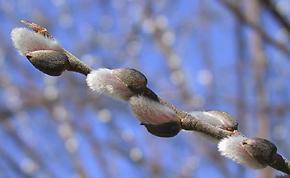 Monday, March 16: Two warm days in a row (14C this afternoon) has resulted in several new sightings for the spring. Four Midland Painted Turtles and a Blanding's Turtle were seen basking along the pond in front of the nature centre. An adult Snapping Turtle and Eastern Gartersnake were also seen (Tom Preney, Dylan Budimir-Hussey). Mark Hamel reported two buttterflies, a Mourning Cloak and Eastern Comma. Chorus Frogs are calling strongly in Tallgrass Prairie Heritage Park. 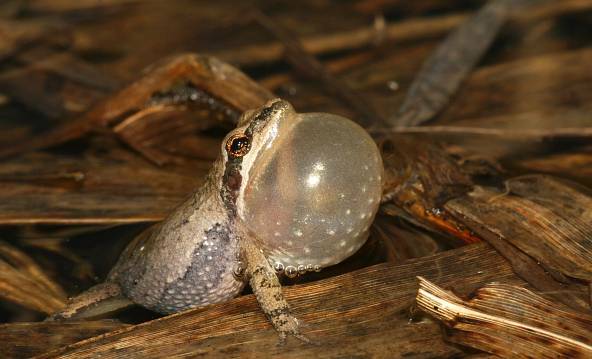 The first few calling Chorus Frogs were reported in the provincial nature reserve yesterday by Mary Montsch. Tom Preney also recorded the first Eastern Phoebe of the spring at the pond boardwalk today. Saturday, March 07: The high temperatures yesterday brought a flood of new migrants to the Windsor area, just in time for our birding trip to Hillman Marsh today. Red-winged Blackbirds and Common Grackles were present in the hundreds. The shorebird cell at Holiday Beach was a great spot with hundreds of ducks including Mallard, Northern Pintail, American Black Duck, Redhead, Gadwall, Northern Shoveler, Green-winged Teal and Wood Duck. The more open areas of Hillman had large numbers of Canada Geese, Canvasbacks and Common Mergansers. Other waterfowl seen today included Tundra Swan, Snow Goose, Lesser Scaup, Bufflehead, Common Goldeneye, Red-breasted Merganser and Hooded Merganser. Large numbers of gulls, including a Glaucous Gull were feeding in the canal at Marentette Beach. Friday, March 06: Temperatures reached over 19C this afternoon, a new record high for this date. The first Killdeer and American Woodcock of the spring were recorded today. Two Groundhogs that just emerged from their burrows for the first time yesterday were present at the feeders for most of the day. Sunday, March 01: Although it is still cold with much ice on the Detroit River there are many signs of spring's approach. Canada Geese have now paired up and beginning to stake out potential nest sites. A few American Robins and Red-winged Blackbirds have returned while resident birds such as Northern Cardinals are starting to sing more frequently. Along the river large numbers of adult Ring-billed Gulls are beginning to concentrate around Fighting Island were they will eventually nest.